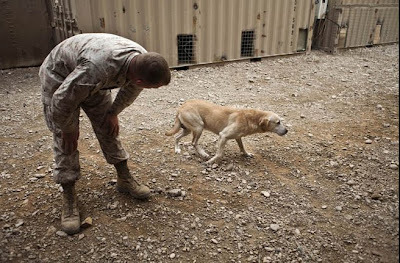 Out of the 58 bomb-sniffing dogs the Marines have in Afghanistan, only one—a brown-eyed, floppy-eared yellow Lab named Gunner—is suffering from such severe canine post-traumatic stress disorder that he had to sit out the ongoing offensive in central Helmand Province. "He's the only combat-ineffective dog out here," says his kennel chief, Cpl. Chad McCoy. 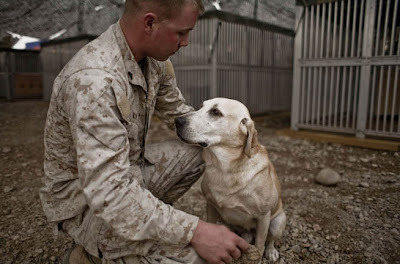 Like their human comrades, some war dogs can handle combat, and some can't. One Marine Corps explosives dog, a black Lab named Daisy, has found 13 hidden bombs since arriving in Afghanistan in October. Zoom, another Lab, refused to associate with the Marines after seeing one serviceman shoot a feral Afghan dog. Only after weeks of retraining, hours of playing with a reindeer squeaky toy and a gusher of good-boy praise was Zoom willing to go back to work. "With some Marines, PTSD can be from one terrible event, or a cumulative effect," says Maj. Rob McLellan, 33-year-old operations officer of the 2nd Combat Engineer Battalion, who trains duck-hunting dogs back home in Green Bay, Wis. Likewise, he says, the stress sometimes "weighs a dog down to the point where the dog just snaps."